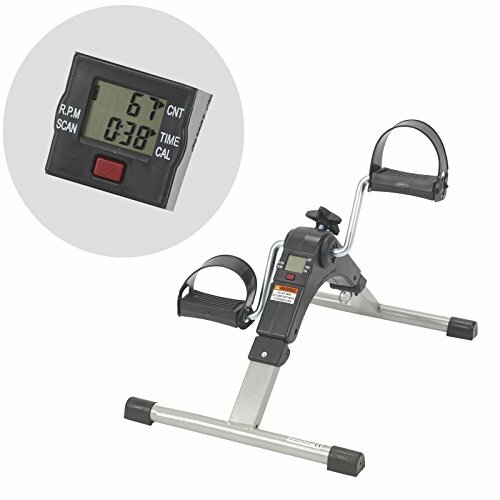 This AdirMed Digital, Foldable Pedal Exerciser Leg Machine is perfect for leg and arm exercises, physical therapy and burning calories in the comfort of your own home or in the office. Enabling you to exercise just about anywhere, this mini exerciser is great for those who want to maintain a healthy lifestyle in a convenient way. Made using a durable chrome frame to supply stability on any surface, this exerciser delivers long-lasting strength for years to come. Pedals that resemble a bicycle feature integrated straps, keeping your feet securely in place throughout your workout routines. A 5-function LCD readout displays your exercise time, revolution count, rpm and calories burned so you can keep track of your progress. It also has a scan feature that alternately displays the measurements automatically, providing an accurate readout of what you've accomplished. The resistance can be adjusted with a tension screw, allowing you to increase or decrease the strength of your therapy to meet your personal ability level. This function is great for those just starting out, effectively improving circulation and body strength with each session. Easy to use, this device comes fully assembled and includes 1 lithium ion battery so you can use it right out of the box. Simply sit down, place by your feet, and push your legs or arms forward in a rotating motion. Lightweight yet sturdy, you can conveniently place it under your desk at work, or in front of the couch at home when you're reading the paper or watching TV. It can also be folded down for easy transport and storage. To protect surfaces from scratches and scuff marks, the base sports four anti-slip rubber pads. This also prevents the device from sliding and interrupting your workouts so you can stay focused on the task at hand. SLIP-RESISTANT BASE. The base of the exercise machine is conveniently outfitted with four anti-slip rubber pads. This prevents it from sliding and interrupting your workouts, while also protecting floors, tables and other flat surfaces from scratches and unsightly scuff marks. DURABLE CONSTRUCTION. Made with a durable chrome frame for stability on any surface, this exercise machine will deliver long-lasting strength and use throughout the years. It's designed with pedals resembling a bicycle, featuring integrated straps to keep your feet firmly in place when you work out.